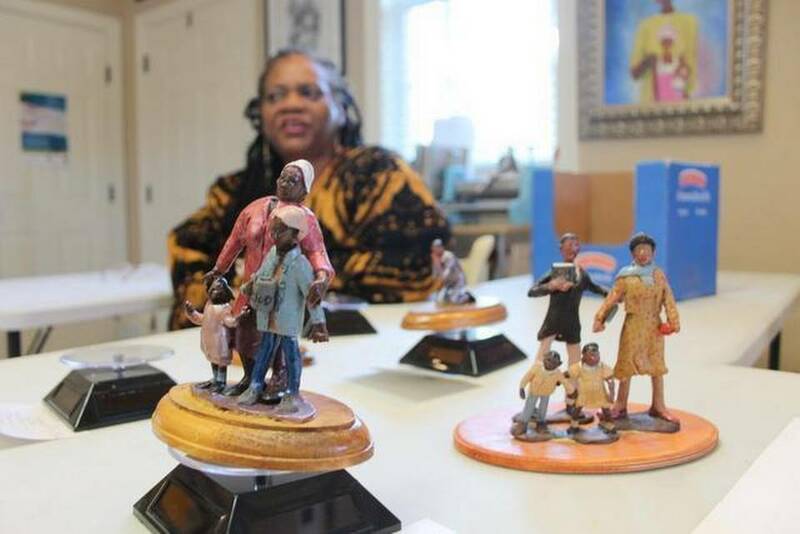 Master artist Pinkie Strother creates unique pieces of art, including sculptures, painting, and illustrations. Some of these pieces represent the community in which she grew up during the 1950’s and 1960’s. Pinkie’s Art also offers art lectures, art lessons and art workshops. Call Pinkie’s Art today to commission a mural or original custom piece of art. From Rural Southern Maryland and the fourth sibling out of nine, Pinkie’s passion for her gift derived from the support and guidance of her family, and community of which she gives homage to with her Childhood Memory series. Pinkie Strother received formal training in art from Bowie State University where she studied to become a teacher. She continued her studies in art receiving a MFA degree from the Maryland Institute College of Art. During her art career, she has taught college level art courses, and K-12 students. She has lectured to social organizations, for public non-profit groups, and private associations. Pinkie has developed an art program for home school students, a summer camp program, and private lessons for adults, as well as children. She has been a long time board member as well as the President of the Fuquay-Varina Arts Council, where she has worked with her daughter Storia to establish the “Gallery Around Town” program to showcase local artists’ work in various locations throughout town. She is also a member of the NC Black Storytellers, where she enjoys weaving her own art with stories that inspire and empower others. exhibited by invitation at the North Carolina Museum of History in Raleigh, NC in 2015 as a featured artist during Black History Month, and again in 2017 as part of the 16th Annual African American Cultural Celebration. She also exhibited and performed at the 2017 Annual Martin Luther King Jr. Celebration in Charlotte, NC. Copyright © 2019 Pinkie Strother. All rights reserved.